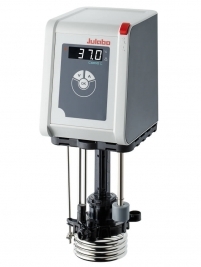 JULABO immersion circulators for controlling temperature in any bath tank up to 50 liters. These units are equipped with a bath attachment clamp for wall thicknesses up to 26 mm. Alternatively, the circulator may be fastened to a laboratory stand. The clamp makes it easy to install the circulator onto an existing bath tank. Parts that are immersed in bath liquid are constructed of high quality stainless steel or synthetic material. Common applications include controlling the temperature of samples, temperature testing of food or luxury articles, materials testing, and evaluation, adjustment, and calibration or thermometers and thermal switches.